Chicago, IL, US — David Bowie is presents the first international exhibition of the extraordinary career of David Bowie—one of the most pioneering and influential performers of our time. The exhibition focuses on his creative processes and collaborative work with artists and designers, and demonstrates how his work has both influenced and been influenced by wider movements in art, design, music, and theater. The exhibition’s multimedia design introduces advanced sound technology by Sennheiser and video installations to create an immersive journey through Bowie’s artistic life. David Bowie is was organized by the Victoria and Albert Museum, London, and is on view at the Museum of Contemporary Art (MCA) Chicago from September 23, 2014 to January 4, 2015.
others in the MCA Collection and exhibition history, such as Cindy Sherman and Andy Warhol—and similar to many artists working today, he has never limited himself to one area of cultural production. “The MCA’s history has been built on a multidisciplinary understanding of creativity from its founding in 1967, and the combination of exhibitions, performances, and programs we present today reflect that wide-angle view of contemporary art. This exhibition repatriates David Bowie, the musical innovator, into the territory of cutting-edge visual and performing art that is his natural home.”The exhibition brings together more than 400 objects, including photography, album artwork, handwritten lyrics, original fashions, set designs, and rare performance material from the past five decades from the David Bowie Archive. David Bowie is takes an in-depth look at how David Bowie’s music and radical individualism has inspired others to challenge convention and pursue freedom of expression. Peellaert and Edward Bell; cover proofs by Barnbrook for the latest album The Next Day (2013); visual excerpts from films and live performances, including The Man Who Fell to Earth (1976) and Saturday Night Live (1979); music videos such as Boys Keep Swinging (1979) and Let’s Dance (1983); and set designs created for the Diamond Dogs tour (1974). Alongside these are more personal items such as never-before-seen storyboards, handwritten set lists and lyrics, as well as some of Bowie’s own sketches, musical scores, and writings, revealing the evolution of his creative ideas. ‘David Bowie’ in 1965 and went through a series of self-styled changes from Mod to mime artist and folk singer, to R&B musician in anticipation of the shifting nature of his later career. On display are early photographs, LPs from his musical heroes such as Little Richard, and Bowie’s sketches for stage sets and costumes created for his bands The Kon-rads and The King Bees in the 1960s. This opening section concludes with a focus on Bowie’s first major hit Space Oddity (1969) and the introduction of the fictional character Major Tom, who would be revisited by Bowie in both Ashes to Ashes (1980) and Hallo Spaceboy (1995). Inspired by Stanley Kubrick’s 1968 film 2001: A Space Odyssey, the single was released to coincide with the first moon landing and was Bowie’s breakthrough moment, granting him critical and commercial success as an established solo artist. 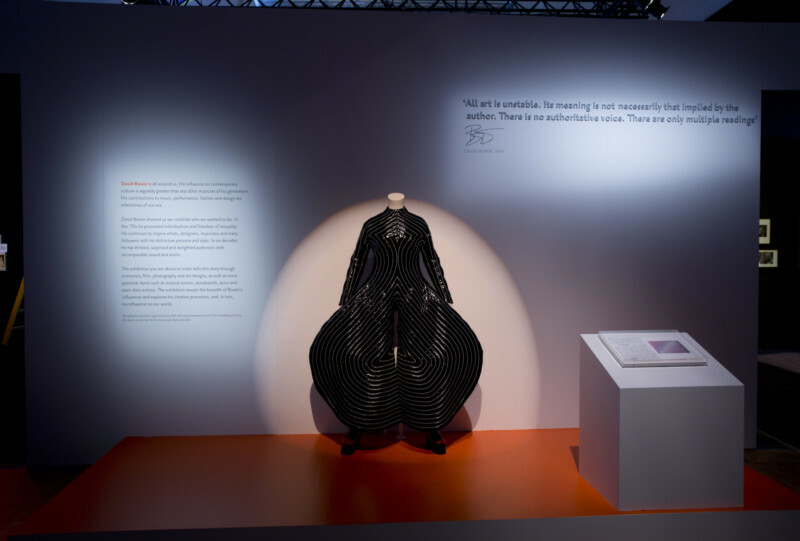 The exhibition moves on to examine David Bowie’s creative processes from song writing, recording, and producing, to designing costumes, stage sets, and album artwork. Working within both established art forms and new artistic movements, this section reveals the scope of his inspirations and cultural references from Surrealism, Brechtian theater, and avant-garde mime, to West End musicals, German Expressionism, and Japanese Kabuki performance. On view are some of Bowie’s own musical instruments, footage and photography of recording sessions for Outside (1995) and ‘Hours…’ (1999), as well as handwritten lyrics and word collages inspired by William S. Burroughs’ ‘cut up’ method of writing that have never previously been publicly displayed. David Bowie is chronicles his innovative approach to creating albums and touring shows around fictionalized stage personas and narratives. 1972 marked the birth of his most famous creation, Ziggy Stardust, a human manifestation of an alien being. Ziggy’s daringly androgynous and otherworldly appearance has had a powerful and continuous influence on pop culture, signaling a challenge of social traditions and inspiring people to shape their own identities. 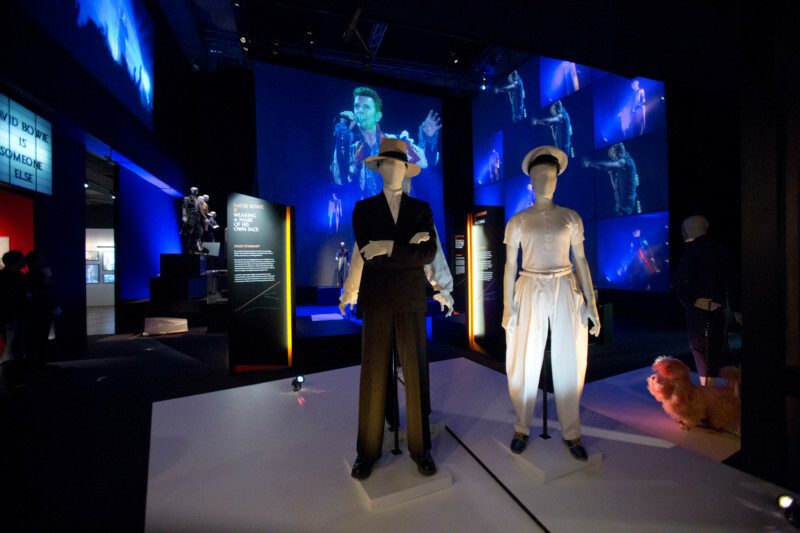 On display is the original multi-colored suit worn for the pivotal performance of Starman on Top of the Pops in July 1972, as well as outfits designed for stage characters Aladdin Sane and The Thin White Duke. Costumes from The 1980 Floor Show (1973), album cover sleeves for The Man Who Sold the World (1970), and Hunky Dory (1971), alongside press clippings and fan material, highlight Bowie’s fluid stylistic transformations and his impact on social mobility and gay liberation. The final section celebrates David Bowie as a pioneering performer both on stage and in film, concentrating on key performances throughout his career. An immersive audio-visual space presents dramatic projections of some of Bowie’s most ambitious music videos including DJ (1979) and The Hearts Filthy Lesson (1995), as well as recently uncovered footage of Bowie performing Jean Genie on Top of the Pops in 1973, and D.A. Pennebaker’s film Ziggy Stardust and the Spiders from Mars: The Motion Picture (1973). A separate screening room shows excerpts and props from Bowie’s feature films such as Labyrinth (1986) and Basquiat (1996). In addition, this gallery traces the evolution of the lavishly produced Diamond Dogs tour (1974), the design of which was inspired by Fritz Lang’s film Metropolis (1927) and George Orwell’s novel Nineteen Eighty-Four (1949). Bowie’s tours combined choreography and colossal set design, taking the combination of rock music and theater to unprecedented heights. On display are previously unseen storyboards and tour footage for the proposed musical that Bowie would eventually transform into the Diamond Dogs album and touring show. An area has been dedicated to the monochrome theatricality of Bowie’s Berlin period and the creation of the stylish Thin White Duke persona identified with the Station to Station album and tour (1976). It also investigates the series of experimental and pioneering records he produced between 1977 and 1979 while living in Germany, known as the Berlin Trilogy. 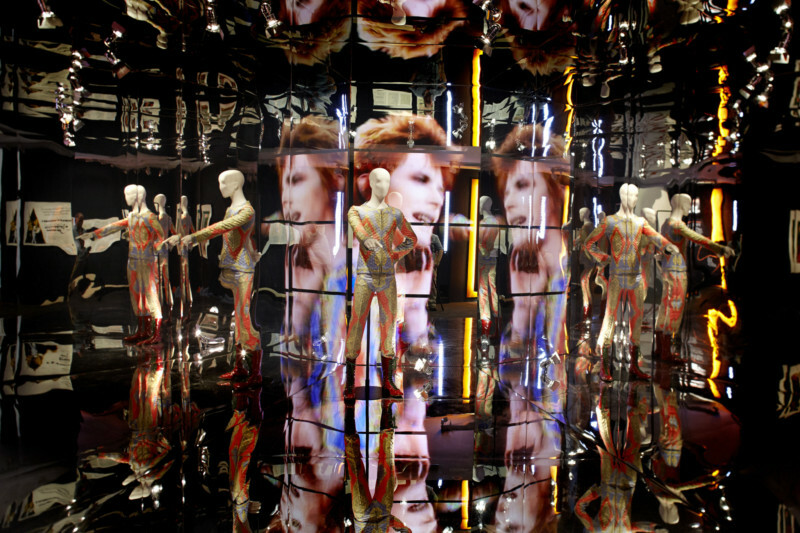 David Bowie is concludes with a room of towering projections of footage from his signature concert tours as well as the costumes that defined them. 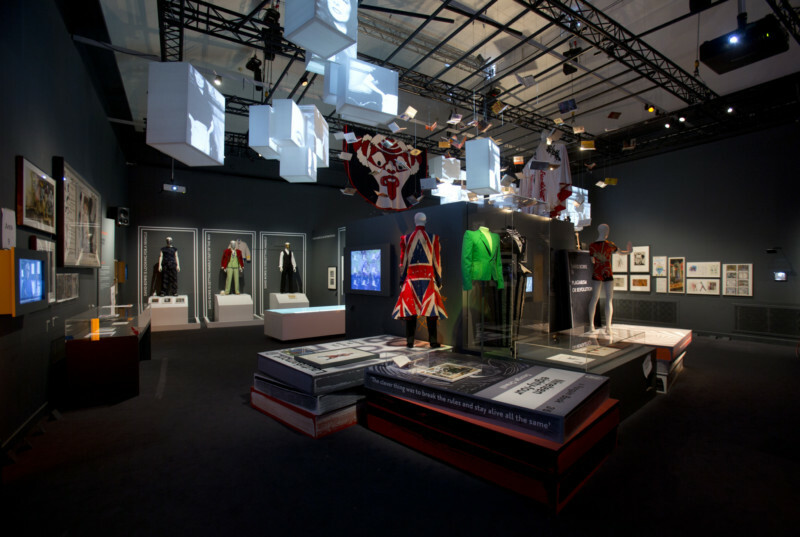 The exhibition was originally organized for the Victoria and Albert Museum, London, by curators Victoria Broackes and Geoffrey Marsh. Victoria Broackes is Head of Exhibitions for the Department of Theatre and Performance at the V&A and Geoffrey Marsh is the Director of the Department of Theatre and Performance at the V&A. At the MCA, the exhibition is curated by Michael Darling, James W. Alsdorf Chief Curator. The V&A is the world’s greatest museum of art and design, with collections unrivalled in its scope and diversity. The V&A’soutstanding collections represent over 3000 years of creativity from across Europe, Asia, and the Middle East. The Museum offers internationally acclaimed temporary exhibitions, complementing the Museum’s permanent collection, taking a look in depth at a broad range of subjects including design, fashion, photography, architecture, decorative arts, painting, and sculpture.